The best way to illustrate the qualities that I consider important in games is to give some examples of games that I’ve derived a lot of enjoyment from over an extended period of time. Most of the games listed below will most likely be revisited and discussed in greater detail in forthcoming posts. I’d hope that most people reading this have played at least some of these games already, but I’ve tried to explain briefly what they’re about in case there are any weirdos out there who didn’t grow up with the exact same set of influences as I did. The common characteristic that all these games share is that they manage to deliver something beyond the typical expectations of games as they were defined at the time, either in pure technological terms, or with the issues that they attempt to address with their design. Metroid Prime was a game that lots of overly-precious Nintendo fans were anxious about before its release. How could a team that no one had heard of manage to honour the legacy of Super Metroid? How was platforming going to work in first person perspective? Would the game be dumbed down, or miss the point, or just be in 3D for the sake of it? They needn’t have worried, as the gamble paid off and Retro Studios managed to deliver one of the landmark games for the current wave of home consoles. Ever since the mid-1990s when Raven started cranking out pseudo-RPGs using Id’s engines, we’ve been teased with the prospect of a proper first person adventure game. 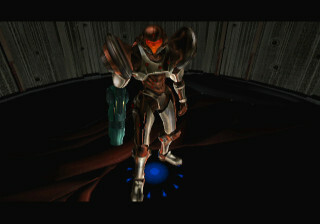 Metroid Prime is that game. The game world is crammed with detail which never seems showy or out of place. There are literally hundreds of ambient effects that heighten the sense of immersion. While there is a fair amount of combat (including some truly epic boss battles), there is as much fun to be had exploring the environment, discovering secrets and solving puzzles with the aid of Samus’s Morph Ball mode and a plethora of other useful gadgets. The art direction and music are also flawless. The game has 99.64% longevity and… ok, you get the idea. A minority of players had a problem with the controls (fair enough, you can’t expect any single control scheme to please everybody), or, presumably labouring under the misconception that you’re supposed to play through games as quickly as possible without reading or looking at anything, complained about backtracking. These complaints are really small and inconsequential flies dipping their toes in a family-size tub of extra minty ointment. Reading back, it sounds like more than any other game on the list I’m exhorting the reader to buy and play this one, and I guess I am. Go! Buy! Play! Warren Spector’s heady blend of fashionable conspiracy theories and science fiction cliché seemed an indulgence even at the turn of the millennium, but it allows this innovative espionage thriller to draw on a wide variety of influences, pitching some genuinely surprising plot twists and preventing the narrative from sagging at any point. …Is the sort of thing Edge might write about this groundbreaking but much over-analysed RPG. Deus Ex is an action RPG (or an ‘immersive sim’ as the developers put it – it’s certainly not an FPS) that puts the player in the role of stealthy cyborg secret agent J.C. Denton, who must unravel a conspiracy that takes in the US government, the Illuminati, aliens, genetic experiments, rogue A.I.s and lots of other stuff that I’ve since forgotten in the five years since I last played it. The game succeeds in repackaging the best bits of Thief and System Shock while adding character interaction (with a decent script) and never forcing the player to rely on stealth. The world simulation was detailed enough for cunning players to devise solutions that the developers hadn’t anticipated. The game was capable of supporting plot branching scenarios that defied players’ expectations (even though none of the choices had any influence on the final outcome). Unfortunately the game did not sell very well, and a disappointing sequel (ill-advisedly developed back to back for the PC and Xbox) further eroded goodwill towards the franchise, meaning a third installment is very unlikely. So it’s just as well the first game managed to explore its premise so thoroughly. In a nutshell: Two funky aliens get stranded on Earth and have to rebuild their spaceship. I realise that doesn’t tell you very much about the original game, but that’s pretty much all the information that was printed on the back of the box. Kids today with your streaming video previews, don’t know your born, etc. Toejam & Earl is an action adventure game for two players for the Sega Mega Drive, which holds the special distinction of being my favourite game of all time. The reasons for this are manifold – the most obvious being that it’s infinitely replayable, due to the game generating random level layouts and item and enemy placements every time it’s played. The level of randomisation is quite extreme (especially by modern standards, where fixed level designs and scripted events are near-ubiquitous), ensuring that each playthrough is wildly different (in terms of content, pacing and difficulty) to the last. It takes extended play to discover all the hidden jokes and random events. Even practiced players will rarely feel that they are totally in control of the situation, thanks to the unpredictable nature of the enemies encountered and the collectible items (‘presents’), which can only be identified by using them*, and which can quickly turn the tables on the overconfident. As with certain other games on the list, the sequels (a slick but unexceptional platform game on the MD, and a somewhat bodged attempt to ‘urbanify’ the original, which eventually came out on the Xbox) failed to reach the same heights as the original. *or by paying a Wiseman in a Carrot Suit to examine them. Obviously. Bullfrog’s finest hour (and possibly the only game they produced that didn’t degenerate into endless repetition by a third of the way in). Syndicate was an early real-time strategy game (from the days before the label automatically meant ‘Command & Conquer clone’) that put the player in control of a squad of four mindless, amoral corporate cyborgs given the task of conquering the world by executing street-level paramilitary operations. Instrumental in this was the research of new weapons and cybernetic enhancements. The most compelling tool in the armoury was the persuadertron, a close-range device that could be used to convert bystanders into obedient followers. Syndicate offered the player the freedom to reach objectives in whichever way they saw fit: send in a lone agent with a sniper rifle to pick off the target from the next block; persuade a crowd of civilians to overpower the security forces; split up your team to create a diversion; steal vehicles to get through security checkpoints; or just cut a swathe through the area with miniguns, flamethrowers and gauss guns. Whichever option the player took, they were rewarded with a steady stream of new toys and the thrill of wanton destruction. The sequel Syndicate Wars ditched the sleek 16-colour VGA visuals for Playstation-friendly low-poly 3D and failed to recapture the feeling of the original game. It is rumoured that several attempts have been made since then to return to the franchise, only to be cancelled in preproduction. Although some more recent games have managed to expand upon the ideas first seen in Syndicate (the Grand Theft Auto series, and squad-shooters Freedom Fighters and Darwinia spring to mind), nothing has managed to recapture its stark, elegant, and utterly brutal approach to guerrilla warfare. There is a (very) rudimentary single-player campaign game (where you travel around Tokyo and Osaka challenging SNK and Capcom staff members to card battles), but it really exists purely as a means to collect more cards. Even though the computer A.I. is quite stupid, the actual card battles are incredibly addictive. There is almost endless scope to build new decks and formulate new strategies. Once the single player campaign is completed you can keep on playing – the 20 round tournament mode makes long journeys fly past. My favourite SCUMM game, which also happens to be the first one I played, and the one that I still kick myself for resorting to using a walkthrough to complete the first time. (Since then I’ve taken pains to avoid using walkthroughs at all costs, except in mitigating circumstances where the puzzle in question is actually unfair – this means you, Discworld!) I think it’s still probably one of the most successful attempts (along with Indiana Jones and The Fate of Atlantis) to tell a story in a cinematic fashion in a game. It’s hard to describe why the game feels so different to the other SCUMM adventures (including the first Monkey Island game). I think it’s the fact that instead of presenting a traditional heroic story where everything is present for a reason that leads up to a signposted Important Plot Event, it instead drops you into a world where most of the inhabitants are oblivious, apathetic or mildly embarrassed about their role in any overarching plot. We can explore the detritus that has washed up in this version of the Carribbean (fruit salad, used coffin salesmen, Elvis memorabilia and an unhealthy obsession with manatees) but we were not privy to the drunken conversations around a pool table that caused it to be this way. The result is a world that feels lived in. Going back to this game serves as a reminder of what a damn shame it is that Ron Gilbert doesn’t seem to be able to get a publishing deal in today’s psychotically risk-averse climate. Come on you wusses, where’s your sense of adventure? Although RE4 is fairly new compared to the rest of the games on this list, I’d be willing to bet that its inclusion will not look like the result of hype-blinded misjudgment when this post is dragged out of the archives in years to come. If any game was worthy of the term ‘instant classic’, it’s this one. Resident Evil 4 is a sustained twenty hour composition of tension, catharsis, desperation, awe, elation and blind reptilian panic. Open areas in the game are densely interactive playgrounds which demand ingenuity and skill from the player while simultaneously giving them a medium in which to express themselves and engage the game with their own personal playing style. (Many players have spent more time in the astoundingly excellent ‘Mercenaries’ bonus mode, which simulates endless zombie skirmishes where the player must rack up kills against the clock, than in the main campaign.) The bosses, dungeons, puzzles and setpieces that chain these ‘freestyle’ areas together are no less brilliant, offering relentless diversity. You might think that Streets of Rage 2 is an odd inclusion in this list, as it’s a game that was safely within the boundaries of a well-established genre and doesn’t do anything obviously exceptional. However when the game was first released, the fact that a small team who hadn’t made a scrolling beat-’em-up before had put together a brawler for the Mega Drive that was at least as good as any of (genre masters) Capcom’s arcade efforts was quite a big deal. Streets of Rage 2 is in a way an Evil Dead-style remake of the first game rather than a totally distinct sequel. Lots of ideas from the first game are re-used, but everything has been rebuilt from scratch with vastly improved graphics. The arrangement of the levels (each was made up of a series of thematically linked scenes, which added a tiny amount of narrative structure to the incessant pummelling), the amount of personality in the enemies and bosses and the superb music all set the game apart from the pedestrian efforts that populated the genre. It’s not perfect of course. It was always hopelessly easy and the new characters (Max and Skate) aren’t as much fun to use as Axel and Blaze. Obligatory newbie advice: if you haven’t played any of the series before, play them in order. 2 is the best, but play it first and you’ll spoil 1, which still has its merits. The third game isn’t as terrible as some people make out, but it’s bloated and overcomplicated compared to the second, and the music isn’t a patch on that in the first two games. Quake represents easily the biggest single technological leap of any game in the list, or possibly of any PC game ever. Quake’s implementation of network gaming, aggressive use of dedicated graphics hardware, and embracing of configurability and user extensibility laid out the blueprint for modern PC games. I still remember the first time that I loaded up QTEST1 on our clapped-out 486DX-4 and staggered around gawping in unalloyed amazement at this physical place that was now accessible through a simple PC. A few months later we would be playing the game through the first generation of 3D accelerators and nothing would ever be the same again. Technical advances aside, the big question is whether Quake was a better game than Doom. There’s no definitive answer. I must admit that I probably spent more hours playing Doom than any other FPS before or since, and the fact that it was first means that for many people it will always be Neil to Quake’s Buzz. But Doom didn’t have sixteen-player deathmatch. Or Threewave CTF. Or Team Fortress. Or Slide. Or that grenade launcher. Like an earthenware jug, a stained glass window or a wicker… err, donkey, Transport Tycoon is an example of a product of an endangered (or possibly extinct) traditional craft. Programmed in assembler by a one man team, Transport Tycoon is as pleasant and relaxing as drinking real ale in a traditional pub on a warm Summer evening in 1956. The fact that nothing in the game is the result of a compromise or imperfect communication between stubborn humans bestows it with a highly satisfying level of attention to detail. The interface is arranged with everything close at hand. The remote camera windows allow the player to keep track of several things at once without having to scroll around the map. The satisfaction of watching a fully loaded coal train pull into the station, or the first two trains successfully negotiating a junction system you’ve spent half an hour painstakingly building, is palpable. Even the parping MIDI jazz soundtrack is designed to lull the player into a blissful torpor. It is a surprise to find that a game that is essentially a glorified Hornby trainset with a somewhat cumbersome track-laying interface can be so engrossing. For some reason being able to build an orderly clockwork system in an isometric landscape is ten times more fun than shepherding characterless statistical smoke around in any of the Sim City games. As with other noteworthy games from the same genre and period (e.g. The Settlers, Sim City), as hardware power increased, developers struggled to offer anything other than just more of the same but with larger array sizes, which is probably why I’ve never been able to get into the Rollercoaster Tycoon games or Locomotion, even though by any objective measure they’re better games. There are of course many other games that would be equally worthy of inclusion (such as Soul Calibur, Gunstar Heroes, Puyo Puyo, Freedom Fighters, Betrayal at Krondor, Sonic the Hedgehog, Ultima IV, Doom, Shining Force, Elite, Bug Bomber, Noiz2, StarCraft, Virtua Racing, Rampage…), I may take a look at some of these in a future installment.